It often makes me wonder when people talk of being inspired where that inspiration comes from. I become really cross with people who claim to feel uninspired or cannot create because of a lack of inspiration. Probably unfair but then I guess I never have that feeling. I can really say that inspiration is a constant companion. There are several reasons for this I guess. One of the biggest inspirations to me is that I have the opportunity to inspire in my own feeble way. The people I work with are often at the very lowest of points in their lives for many reasons. I don’t just mean there is a lot of bad stuff happening or that there are family arguments. I am talking about a truly frightening depth of depression and mental illness. A place I think, unless you have had the misfortune to be there, is a very difficult thing to appreciate. Having been there, survived (just!) and clawing my way back up again I have the opportunity to show people some hope, that you can recover and you can rebuild. Equally, I find those people I work with at S2C truly inspiring. The battles people face against illness, the pain they are in, both mental and physical, yet they can still be the most astonishingly creative individuals. There is a lot of bravery at S2C but nobody will admit it! I also take inspiration from my illness. Particularly my mental health and my type 1 diabetes. Having had type 1 from childhood the consequences of poor care are stacking up. I use this and some of the debris(insulin vials, assorted plastic etc) to tell the story about living with it and raising awareness. The same for mental health. Some of my artwork is disturbing but if that is upsetting, well good, people need to know what its like and art is a great way to explain. Finally, everything! Everything should be an inspiration. I really think that I could create from any starting point. I prefer painting but making, sculpting, photographing and so on. Why should there be limits, why stop yourself. Never say you are uninspired. The world is inspirational, the people in it are inspirational and you are inspirational. Good fun again with Donna Campbell taking the session. We finished off the rats and moved on to cockroaches for part of a display in Angel Yard for Yarn In The Yards. These were made with recycled plastic trays and bubble wrap. A shortened group with the AGM but all were getting on with projects. Making wool house bunting for Yarn in the Yards, painting blocks, knitting, rat building and apron sewing. good meeting. Thank you to all who were there. Lots of positive news, support and opportunities for the year ahead after looking back on a very successful year last year. S2C is the people that use it and they are all talented, brave and inspirational people. We had a nice session which was based on adapting and creating designs for playing cards, we had a set of templates and a pack of cards and set about painting and collaging different designs on our cards, some designs became quite surreal, with different themes and images. A stamping set would have been useful for adding lettering and numbers. We shall possibly extent the session to create sets of different designs. The group were looking at writing with a view to using metaphor, that is implying one thing through another. We did the usual warm up then thought of metaphors to describe things Maggie, the session leader, suggested. We took this to create a conversation between the metaphorical objects! The group was led by Carol Gaston who showed everyone how she went about creating one of her cog based pictures. This involved using a compass to draw sets of circles inside each other. Then adding the cogs and other joining pieces before painting. I was sat today thinking how lucky we are at Space2Create to be blessed with so much generosity. Lets face it, without that spirit of giving we would not exist. It’s not always just about money either. Talking of money, the first act of generosity that crossed my path this week was the Cumberland Building Society giving a funding grant. Not only did they give us the grant but the local branch manager phoned me up and spent a good while with genuine interest in what we were doing and arranging to come down and see what happens at S2C. Then the Mayor of Kendal took time out to call in and take a look at our new exhibition. We hadn’t invited him specifically but he took the time to come and look and made the day of Carol, the artists, who struggles with chronic pain. I have always said that being acknowledged is an important part of what we do at S2C, especially when you are feeling marginalised and forgotten because of illness. Then a regular visitor on their way out of the unit turned to me and told me that it was always fantastic to come along to S2C because of the brilliant atmosphere and work we did. For me that is very good to hear. We have to put a lot of hard work in to keep the place going and when somebody says something like that it gives you a lift. On Wednesday our two volunteers on the Kentmere Ward had to be fitted with personal alarms as there had been some trouble with a patient who was struggling with their mental health problems and being disruptive. It happens. Sometimes people are in real distress and the only way to deal with it for them is anger. What was amazing was the person had been in the art session and enjoyed it, as a result the ward had said, things had been a lot calmer. The power of art. I salute our volunteers for the work they do on the ward and to the ward staff for acknowledging the value of what we do there. Then to today. On reflecting over the day I continue to be overwhelmed by the generosity of individuals who give up their time to work alongside service users and help create the atmosphere of wellbeing. Even more those individuals struggling with real personal illness still struggling and giving their time to do what they can to help S2C work. Finally to Zoe Baker. She has been incredibly generous in taking on the Keswick to Barrow walk and raising funds for Space2Create. She was even doing a practice this weekend up to Shap despite a torn knee ligament. We can only ask that you support her through the K2B website where you can sponsor her. Wow. What a generous community we are in. Artists, volunteers, funders, local politicians, the public, medical professionals, writers, care staff, friends, strangers and everyone who by their actions, giving, supporting, interest and generosity help S2C. Thank you. Karen Lloyd kindly took the session. For the first part we looked back at new begginings and memories from childhood. We developed these ideas focusing in to look at details and evoke the memories. In the second part Karen gave out some images to write a fictional piece about. Mat created this poem from the picture below. To confuse and confound the senses. I pause, reviewing endles line. A figure in parallel with mine. Where the gaze of the other cannot seize. On the Ward, we explored Pop Art word drawings (or “BatMan Words”, as some preferred to call them!). We used various forms of lettering, and embellished them with appropriate images and garish colouring, so that a very vibrant, immediate, and even explosive effect was achieved. The session was very free-flowing and engaging – much like the words themselves. A busy session but they all had packed away before I was ready to take photos! Some continued with making aprons while others were creating fabric houses for Yarn in The Yards bunting. Some were on with their own sewing and painting projects. Good session! The group were creating pictures using wool, buttons and pens. These look very effective. Today the group was rats! We had Donna in showing how to make rats from tape rolls, bubble wrap and papier mache. This is for Yarn In The Yards and a display in Angel Yard. It was a good fun session. We will finish them off next week. Sometimes the constant social media grind can be overwhelming and some of the content can be just dreadful.Not to say that my blog is a decidedly under par affair, though I do tend to waffle on about stuff. I tend to have a bee in the old bonnet about something or I feel the need to rattle a cage or two. As long as the post I do and Space2Create put out have purpose. Our social media presence as a charity serves many roles. Displaying what we do to the public and informing them of events is a big part of it. We need to let people know we are there and show how we are helping people. This is to promote our work, show our funders and donators what their money is being spent on and also make people who might need our help aware of our existence. We like to promote the artwork our service users create as well as showcase the work we are exhibiting. Having their work shown and liked is a big boost to confidence and esteem, an important part of what we hope to achieve with people who come to us. If you see a piece of our artwork you like then say so! It might just be that extra lift to somebody that helps them break free of their depression. We also use social media to get across messages about the various difficulties people face. It is surprising the level of misunderstanding about many illnesses that exists among the public, in particular mental health. We are not just painting a few pictures, the whole activity that goes on at S2C is about rebuilding lives devastated by illness. Some of it is very subtle and sometimes the art is a veneer for a whole host of benefits from participating. All the social media output also acts to keep people involved. Sometimes people are too ill to attend or their appointments clash, they end up having prolonged hospital stays. Being able to check out what is going on helps to maintain links and for them to feel involved by interacting. So please do Like our page and encourage your friends to like us too. You never know you just might be able to make somebodies year with an appropriate like or share! A good session of printing this morning. We used specialist printing foam which can be drawn on with a pen. It gives crisper and even coverage than using polystyrene. Similar to lino cuts but less control however very easy for begginers. We then inked them up and put them through our roller printing press to print on postcards. Some great images were produced. In the Ward session today, we had a very productive printing session. The techniques used were to inscribe a pattern or picture with a biro into a polystyrene tile; then to roll out ink (of one or several colours) on acetate, and to roll this ink back onto the inscribed tile. Finally, the inked tile was pressed onto paper or card, turned over, and the paper rolled over with a clean roller on the other side to create an imprinted image which could then be peeled off. The results were very varied and pleasing, with some now being displayed on the wall of the Ward. The group had a busy day. They went for a walk down to ArtSpace then did some planning for Yarn In The Yards to do pieces out of felted wool for bunting in Wainwright’s Yard. Then some started on a project making aprons, some decorated eggs, some sewed and others were working on their own projects. The DeafArt group, as well as popping along to ArtSpace 26a, were busy painting stones with images and patterns. Ant was drawing. Today the group was mono printing. We aimed to show the group how to use less ink to get better prints, also masking and tracing techniques. The group soon discovered how too much ink leads to messy prints and less well defined lines. Masking is where yo block out an area of ink using tape or paper. We were tearing pieces. Tracing is the way to transfer a picture to print. We also explored different ways of making marks. At Space2Create one of the things we hope to achieve is enabling everyone who comes to us to create without any fear. It never ceases to amaze me how, in our modern society, creativity is feared. Not in any sinister way. We can all admire the wonderful work of artists. What I am talking about is the fear of being creative, of making mistakes, of not being accepted. For the people who come to us that fear is entwined with their needs as vulnerable adults. They fear being exposed, of being different, of getting life wrong. And why shouldn’t they be fearful. It is hard enough to face up to life when you are well sometimes. In illness and adversity it is very easy to become isolated and cocooned. Take no risks and there is less chance of being hurt. 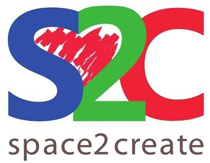 At Space2Create we value everyone’s creativity without any preconditions. We celebrate everything that is created and value the contribution each individual makes. We support and nourish creativity and in so doing feed resilience and willingness to take risks, to become more open and involved, being resilient and to being part of the community. Do not be afraid, be creative in whatever form you choose. It is not wrong to draw or paint or build or sculpt or make. Do it, feel good about yourself and feel sorry for those who can only make judgements. Acceptance of our creative right is a step to achieving wellbeing. Don’t forget it is the factory open weekend this weekend and Saturday 2nd April is the BBC Get Creative Day when we will be running a printmaking workshop. See poster below. It seemed like everyone was doing something different today. One person was creating printed pages for a book, some were making mini books coveted with material. There was some egg painting, jewellery sorting, matchbox mini art and creating painting backgrounds for a project. The group were being very colourful today drawing random patterns and using colour changes to show the shapes made. A quiet session with loads off on Easter breaks or with kids on holiday. We were putting the finishing touches to a book we are making of writing and artwork.